Graphene is one of the thinnest materials in the world, being two-dimensional (2D) and only one atom thick. Its ductility, resistance, elasticity and conductivity make it ideal in terms of exciting scientific innovation and open up all sorts of revolutionary possibilities in technological and industrial applications. On 8th May 2015, Sir Andre Geim, the 2010 physics Nobel Prize winner, was honoured with the “Capo d’Orlando” scientific award, now in its 17th year. In 2004, Geim, a lecturer at the University of Manchester, along with his student Konstantin Novoselov, discovered graphene, made up of carbon atoms in a hexagonal cell layout. Alongside his many other accolades, he is also the only Nobel prize winner to have won the Ig Nobel Prize, awarded by the University of Harvard in 2000, for levitating a frog in a magnetic field. 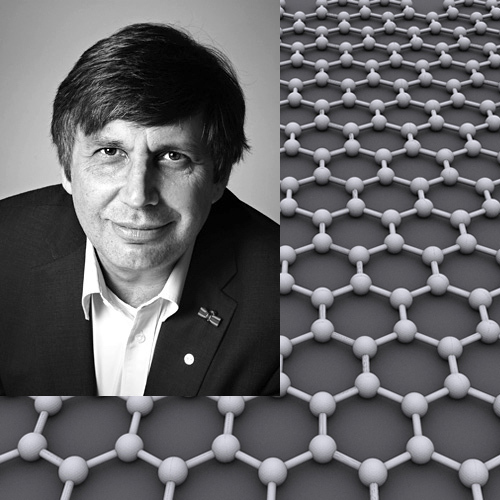 The discovery of graphene is an extraordinary opportunity for Europe. Indeed, a “Graphene Flagship” research group has been set up, funded by the European Union to the tune of one billion Euros. More than one hundred prestigious international universities and scientific institutions are participating in the project. Many companies have expressed an interest in the commercial applications of the new material, including the multinational Head, which specializes in sports equipment and which is already marketing an innovative tennis racket made with graphene fibres. After visiting the Museum on 9th May 2015, the British physicist autographed a sticky tape dispenser as well as a box containing a single specimen of graphene and a grey-coloured sample made up of 500 layers, one on top of the other. On the box he also made a sketch of the material’s hexagonal structure. These rare specimens make the Campanian Mineralogical Museum the only one of its kind in Europe. The Nobel Prize winner demonstrates graphene’s properties to the Museum staff.